1. What does the person in the role need to do to be considered successful? For this job, the most important performance objective was building a team of outstanding leaders and a hiring process that would allow the company to scale quickly across the U.S. Second on the list was developing marketing partnerships with the Fortune 100 at the CEO and COO levels. 2. Why would a top person who’s already fully employed and highly satisfied want this job? In this job, building the company and achieving a remarkable societal mission was the big lure. This is called Job Branding. 3. Who knows the ideal candidate? As far as I’m concerned, the easiest way to source candidates is via aggressive networking. 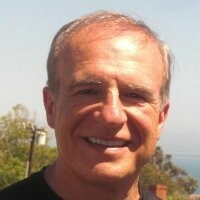 My term for this is PRP – using a Proactive Referral Program. LinkedIn Recruiter is the perfect tool for this. I’m dumbfounded that so many recruiters and sourcers think LinkedIn is largely a database of 500 million names. It’s not. It’s a structured network of 500 million people who are connected in some way to everyone on the planet. To me it’s a waste of time looking for skills-qualified people who are willing to take an ill-defined lateral transfer. These are the strangers in the blue circle. This is a surefire recipe for hiring competent but unspectacular people. The best way to hire someone who’s spectacular is to get a referral from one of your first degree connections. 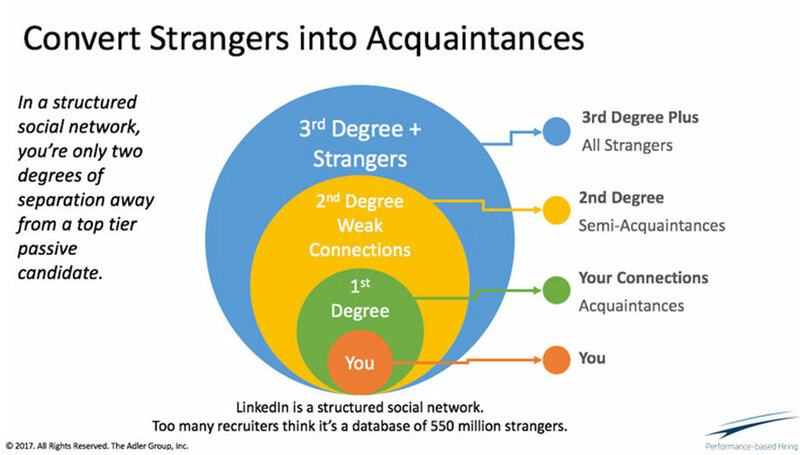 These second degree weak connections are “Recruiter’s Gold” since they call you back 100% of the time and they’re superbly qualified. You wouldn’t have called them otherwise. With these people as a starting point, all you have to do is recruit them. The problem in most cases is getting the perfect first degree connection to get the spectacular referral. I call these people “network nodes.” Often these are vendors, customers, advisors or project team members. Let me use this CEO role as an example to describe the process I used to find some great nodes who were not yet first degree connections. For this job I knew that the ideal candidate needed to have built and run a company of about $100-200 million or be a COO at a company with multiple locations. There are a number of business groups that cater to CEOs of these sized companies. I connected with the COO of one major business organization that I found on LinkedIn that has over 4,000 CEO members. The person returned my InMail within hours and gave me two names and some other networking ideas in the hospitality and entertainment industry. I then looked up the names of big companies in these industries and headquartered in the same area as my client. This search resulted in two talent leaders whom I personally knew working in the right industries. Talent leaders for these types of companies are great nodes since they work with my “ideal candidate” every day. One way to get referrals from these nodes is to simply ask who’s the best they know. Another way is to search on their connections and ask about some of the people you found that could be good prospects. The third way is to find other nodes by looking at the “People Also Viewed” section on their LinkedIn profile. Collectively, this PRP approach yielded three more names including one “Please don’t recruit her” response. That’s super gold! After connecting to them I’d then cherry-pick their connections to pan, aka search, for some ideal prospects and ask if they’d refer the person. I’d then expand the PRP to people outside the company and do the same thing. I found a great controller this way by talking with a senior manager at a Big 4 accounting firm, a bunch of HVAC engineers by connecting with the head of their professional group and a national accounts sales manager by talking with the buyer at the biggest hardware store in the U.S.
LinkedIn is a structured business network of professionals, not a flat database of 500 million people. When viewed this way, it’s easy to identify some great people and connect with them in a few days. To me this is a far better recruiting approach for improving quality of hire. Since you’re only dealing with a few spectacular people, you’ll also likely reduce time-to-fill and lower cost-per-hire as part of the process.